Chalk it up to Maine’s long winters, or the fact that much of our state is rural in nature, but there seems to be an unusually high percentage of extraordinarily talented musicians in our state. You’ll find them literally everywhere - from Stockholm to South Portland – populating each town, city and village in between. Some are doctors, bankers and lawyers; some work on the farm, teach in our schools or work at the supermarket; some rely solely on music to pay all of the bills. They each possess a distinct set of skills usually honed from a young age that were sometimes (but not always) inspired by a family member, a friend or simply a passion to learn. I reached out to six acclaimed Maine-based musicians all over the state to discover who they are, what they do, why they do it, and how it makes them feel. I asked them all the same questions (more or less) but got a wide array of responses. As lead vocalist for one of the greater Bangor area’s busiest and longest-running bands, Allison Ames has been performing professionally for 32 years and says she knew that music would play an integral role in her life from a very young age. 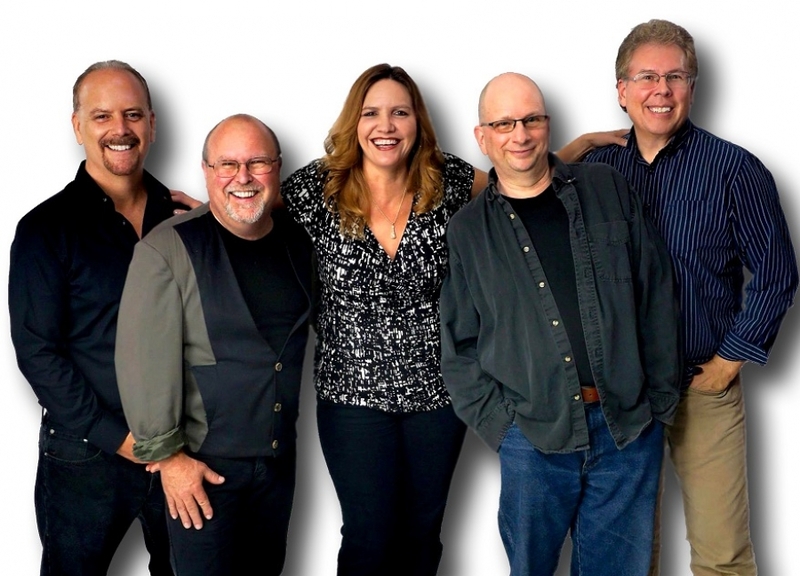 Formerly known as Allison Ames and The Flames, the band is now known as the Allison Ames Band and features three of those original players in keyboardist Jay Lundstrom, guitarist Tom Morelli and bassist Jeff Budge, along with newer member Decran Gulesian on drums. With the exception of her great-grandfather, whom she says played occasional guitar, Ames, originally from Machias, is the only musical member of her family. I asked if there was a specific moment or period in her life when she knew that music would be her thing. “I don’t remember a time when I didn’t think that way,” she responded. “Since I was a little girl, I knew I was going to be a singer. My first microphone was my hairbrush,” she laughed. The Allison Ames Band performs a mix of well-known cover songs and original material in multiple genres, including country and classic rock and roll. Ames: I love songwriting. I used to write much more often than I do today, but I still love doing it. I started writing lyrics at the age of 8, and I have a box full of original songs in my music room at home. The Maine Edge: What is your biggest challenge? Ames: It’s hard to give up a lot of your personal time but we do. When you play every weekend, you miss some important family moments. A year ago, we decided to take one weekend off per month to make it easier on everybody’s schedule. The Maine Edge: What is your favorite song to perform live? Ames: I love singing “Tin Man” by Miranda Lambert. It was the 2018 Song of the Year at the Academy of Country Music Awards. Another one that I truly enjoy singing is “Faithfully” by Journey. The Maine Edge: What is the most rewarding part of being a professional musician? Ames: When the sound is right, and you can feel the energy in the room, you know it’s going to be a great night,” she responded. “You’re in your own little world during that time on-stage. I’ve always loved singing in a band, but I think I appreciate it now more than I ever did. To have the great audience we have - and to play the way that we do - we will never take that for granted. Doug Hoyt is a well-known figure in the Bangor area and now resides in South Portland. Originally a drummer, Hoyt later turned to guitar and vocals while also developing a keen interest in the art of recording. He’s a veteran instructor of New England School of Communication’s popular recording program and now operates his own recording studio in southern Maine called Sounds Like Music. Hoyt’s first band out of high school was called Back Talk. In the early 1990s, his band Sister Blue recorded six records full of original songs – and played them to full bars in the pre-internet era. “It was all done by word of mouth, putting up flyers and starting mailing lists,” Hoyt adds. He led the popular band Spilled Milk for 15 years beginning in 1995. Between two iterations of that band, there was a trio called Lyft. In 2011, he dropped the band name to perform under his own and now leads the Doug Hoyt Trio on guitar and vocals, with musicians Dave Cipullo and Chris Currie. The band pulls from a broad list of cover songs and originals. Hoyt also plays drums with the Laurie Jones Band. The Maine Edge: When did you know that music would be your thing? Hoyt: I started collecting 45s even before I started school. My dad bought me a 1968 Ludwig oyster blue drum kit at Sam’s Music on Main St. in Bangor. I’ve had five kits over the years, but that Ludwig kit is the only one I’ve kept. Hoyt: I love that moment when everything locks in – whether rhythmically or some sonic characteristic – or even one note that you tend to bend, and you feel like you’re levitating. I came to music as a fan and that feeling keeps bringing me back. Hoyt: There are so many entertainment options today I think the challenge is getting people to focus on the music. I’ll be playing two hours of original music this weekend in Biddeford, but that audience will be expecting it. To keep finances moving, I play a lot of venues that want to hear cover songs. I get that. If you’ve worked hard all week, you want to blow off some steam and hear Creedence Clearwater Revival or something you already know and like. The Maine Edge: You’re on stage and you look down at your set-list of potential songs. Is there one that you can’t wait to play? Hoyt: Usually it’s an original. A song that you wrote means more to you. There’s nothing like the feeling when you see someone dancing or bobbing their head or they give you a compliment about something you wrote. With a name like Riff Johnson, this Pittsfield native was bound for musical greatness. Yes, it is a stage moniker (his real name is Jared Sullivan) but it’s a very good one. This resident of Troy says he was at a crossroads in his life a decade ago when he committed to making music his sole occupation. Johnson is a frequent performer in the Bangor area where you can often find him performing at High Tide and Kosta’s in Brewer, Seasons on Main St. in Bangor, and venues from Bar Harbor to Unity and from Hallowell to Hampton Beach, New Hampshire. The Maine Edge: What is most personally rewarding about being a professional musician? Riff Johnson: I predominately play in restaurants and bars. By the end of the week, people are ready to get out, have fun and be entertained. I get to do that. I love taking requests and making people happy. I do kind of the encyclopedia-of-music thing. Even if I just kind of know the song – at least well enough to wing it – I’ll play it. Riff Johnson: Musicians have to plan their schedules four to six months ahead of time because venues book talent well in advance. If you slack on booking yourself, you’ll run into a situation where you’re all booked up. Riff Johnson: “Yellow Ledbetter” by Pearl Jam is one of those cool songs that I love to play. I really like audience participation songs. “Under the Bridge” by Red Hot Chili Peppers is one of those songs. The Maine Edge: Have you recorded an album of original songs? Riff Johnson: About two years ago, I recorded an album called ‘Reinvention.’ We shot the video for ‘All The Way Home’ in downtown Bangor. You can see it on YouTube. This road warrior, originally from Frenchville, currently resides in Madawaska but doesn’t think twice about driving more than four hours to play a show in Bar Harbor. He’s been singing in public since the age of 3 and says performing at church helped alleviate any sign of stage fright. Ouellette has been playing solo acoustic shows for five years and also incorporates live music into his DJ service for wedding ceremonies. He also gives brides and grooms the option of having him perform for the cocktail hour and reception dinner, drawing from a repertoire of 450 songs. For five years, Ouellette has been a member of the six-piece band Kornerstone, based in northern Aroostook County. “We play everything from modern and classic rock to reggae and country,” he adds. Ouellette performs at two venues at Hollywood Casino (the casino itself and Hops House 99), the Sea Dog Brewing Company in Bangor, High Tide and Kosta’s in Brewer, Happy Endings in Bangor, and Sideline Sports Bar in Ellsworth. He is scheduled to perform at Seasons in Bangor on June 13. The Maine Edge: Do you incorporate original songs into your show? Ouellette: When someone asks me to play an original song, I’ll happily do it but I’m my own worst critic when it comes to that. I recorded an album of original songs in 2007. When I hear them now, I cringe. I’d like to find the time to get back into songwriting. The Maine Edge: Madawaska is more than three-and-a-half hours away from Bangor. How do you manage all of those shows in the Bangor area? Ouellette: I just do it. I’m in a rural area here in Aroostook County with only two or three nearby venues where I can perform. I had to expand in order to go anywhere. I don’t think twice about a four-hour road trip. The Maine Edge: What is the most personally rewarding part of this for you? Ouellette: Seeing people engaged in what I’m doing. The money is a plus, but I get more out of it when people react to the music. Musicians thrive on crowd interaction, but I don’t take it personally if there is no applause at the end of a song. At many venues where I play, I consider what I do to be background music. I’m realistic. There is nothing wrong with that. Personally, I prefer a listening crowd. On some nights at Hops House 99 in Bangor, I’ll get people dancing in the middle of the bar. I don’t use effects – other than a little reverb. It’s just my guitar and voice. Ouellette: There really isn’t one, other than hoping for a full house each time. I drive all the time so that’s not a problem. The Maine Edge: Do you have a favorite song you like to perform? Ouellette: I really enjoy singing “Give Me One Reason” by Tracy Chapman. The band does a great version of “House of the Rising Sun” – the arrangement by The House on Cliff. I love singing that one. This Stockton Springs-based musician is best known to his patients as Dr. George Skala of Bucksport’s Maine Coast Chiropractic. During the week, he treats people in pain by adjusting them to restore joint function and improve the health of their nervous systems. Each Saturday from mid-May to mid-October, he performs for up to 150 passengers at a time onboard the 151-foot four-masted schooner Margaret Todd, sailing out of Bar Harbor. An impressive example of Skala’s original music can be found at www.GeorgeSkala.com in the song “Jennie.” The gentle acoustic ballad is accompanied by a video shot in the Stockton Springs area. Skala also performs for wedding ceremonies, where is where I met him during a wedding at Alamoosook Lakeside Inn in Orland. The Maine Edge: How did you come to decide that you would perform in public? Skala: To make the decision to share my music with other people, I had to become comfortable with it and that took a while to occur. I’m still working on it. The Maine Edge: What do you find to be the most personally rewarding aspect of performing live music? Skala: Right, wrong, or indifferent, music allows me to voice strongly – either my emotional or cognitive view of life. It gives me a license to do that. Music is like a skeleton key that can open doors for everybody. Skala: It wouldn’t be practical for me to give up my job as a chiropractor to focus on music. I wouldn’t put my family through that. If it were a necessity, that would be a different story. Whether or not that happens, I’m still able to do something I truly enjoy by going out and playing music. I’m kind of a feng-shui guy, really. I’m rolling with the flow. The Maine Edge: Do you have a favorite song that you like to perform? Skala: In my heart, I’m a nostalgic musician. I love “City of New Orleans” (the Steve Goodman song most famously recorded by Arlo Guthrie in 1972 and Willie Nelson in 1984). It’s kind of a time capsule. There’s a real human kind of a feeling in that song, like a lot of songs from the 1970s singer-songwriter era. Small has played and sung for a variety of bands in the Bangor area, including River Bottom Funk, Dave Mello’s band, Blind Albert, The Nightcrawlers, and Frozen Swamp Chompers (with Eric Green). The duo also performs at Happy Endings in Bangor and The Pickled Wrinkle in Birch Harbor. During the week, Small is Program Coordinator for the Audio Engineering/Live Sound department at New England School of Communications in Bangor, where he is also an instructor. Small: I don’t believe that I chose music. I think music chose me. The music is the reward. I just have to play. The Maine Edge: What is your biggest challenge as a regularly performing musician? Small: The biggest challenge is that we’re in a culture that doesn’t seem to value live music like it used to. For many people, music seems to be an afterthought. Most venues – restaurants and bars – have 18 televisions on the wall, and a lot of people would rather watch sports than listen to music. Small: It’s funny, it changes. If I’m singing a song that tells a story, I can put myself in the room. A song that I’ve always been attracted to is King Floyd’s “Groove Me” (a top 10 hit in 1970). I also love “Fire on the Bayou” by The Neville Brothers and “I Got Loaded” (a 1951 hit for R&B performer Peppermint Harris). I do the arrangement by Tab Benoit.